As one who never read any of the books on which they based the films, I find it difficult to know who to credit or blame while I watch The Lord of the Rings. I hear that Peter Jackson’s movies remain faithful to the Tolkien novels, so I suppose that means that when I find something in the story that I don’t like, the fault lies with old J.R.R. That became an issue as I watched The Lord of the Rings: The Two Towers, the second in the trilogy. While the movie offered a generally intriguing and stimulating piece, it suffered from a decidedly lackluster plot that made it less involving than its predecessor, The Lord of the Rings: The Fellowship of the Ring. Towers picks up literally where the last film ended. With the Fellowship of the Ring splintered, the hobbits Frodo (Elijah Wood) and Sam (Sean Astin) continue their journey to return the One Ring to Mordor, where they plan to destroy it. They quickly discover an unwanted guest in Gollum (Andy Serkis), the corrupted prior possessor of the One Ring who badly wants it back from them. Sam wants to leave Gollum behind, but Frodo takes pity on him and lets him accompany them on their journey. It appears that Gollum – also known by his original name Smeagol - can help lead the lost explorers to Mordor, so he serves a need. While all this occurs, evil Saruman the White (Christopher Lee) prepares for the war for Middle-earth. He opens with an assault on Rohan. Saruman poisoned the mind of King Theoden (Bernard Hill), who now solely follows the advice of his wicked advisor Wormtongue (Brad Dourif). When the king’s nephew Eomer (Karl Urban) speaks for the good of the kingdom, Wormtongue banishes him. Eomer takes an army loyal to Rohan to try to protect it. In the meantime, elf Legolas (Orlando Bloom), dwarf Gimli (John Rhys-Davies), and human Aragorn (Viggo Mortensen) all chase after kidnapped hobbits Merry (Dominic Monaghan) and Pippin (Billy Boyd). Taken by the nasty warriors called the Uruk-hai, the riders from Rohan slaughter the latter group; apparently our hobbits buy it in the assault. When Aragorn et al. encounter Eomer and his group, they learn of the apparent death of their hobbit buddies. However, Aragorn uses his superior tracking skills to establish that the hobbits actually made it out and fled into Fangorn Forest. We then see that they ran into that area and encountered a group of living trees called the Ents. Treebeard (voiced by Rhys-Davies) rescues them but shows them little affection. He treats them suspiciously and takes them to meet the white wizard. But it’s not Saruman; instead, it turns out that rumors of Gandalf’s (Ian McKellen) demise were exaggerated. We learn how he survived and then see as Gandalf catch up with Aragorn, Gimli and Legolas. He rounds them up to head out and deal with the coming war. Gandalf leaves the hobbits with the Ents to keep them safe, and they learn more about that culture. Essentially the film follows these three different plots. Merry and Pippin hang out with the Ents, who eventually play their own part in the war. Frodo tries to get in touch with the Smeagol side of Gollum and we witness personality conflict inside the latter. In addition, Frodo gets more and more poisoned by the Ring and has to deal with his own issues. Gandalf, Aragon and the others go off to take part in the burgeoning battle. They come to Rohan and try to free the king’s mind from the clutches of Saruman before they launch into battle. Aragorn also sees some romantic possibilities with the king’s niece Eowyn (Miranda Otto), which leads him to conflict due to his prior commitment to the elf Arwen (Liv Tyler). Most people feel that Towers will gain in stature and power when we see the trilogy’s concluding chapter, The Return of the King. That’s probably true, as King will tie together the whole saga. As the middle chapter, Towers lacked the plot set-up and exposition that helped make Fellowship intriguing, and it also features neither a proper beginning nor an end. It just begins, and we get no explanation about what came in the first film. That means neophyte viewers will definitely not want to check out Towers unless they’ve already seen Fellowship. The world of Tolkien is dense and confusing enough even with some foreknowledge; I can’t imagine how lost you’d be if you didn’t have a viewing or three of Fellowship under your belt before you checked out Towers. I don’t regard the lack of exposition in Towers as a fault, though. Actually, I give Jackson a lot of credit because he trusted that the audience would know their stuff in advance. Any quick synopsis at the opening of Towers would have been insufficient to cover matters anyway, so he treated things appropriately. As I mentioned at the start, when I did find fault with Towers, I couldn’t be sure if I should blame Jackson or Tolkien. My two main complaints relate to the lack of proper story and the absence of much character delineation. I regard the former as the less problematic of the pair. Indeed, my concerns are probably overstated, for it’s not like Towers has no plot. After the dense exposition of Fellowship, it probably became inevitable that the second chapter would seem thinner in comparison. On its own, however, we can see that a lot happens in Towers; it simply lacks the broad scope of the first film. The second issue is a bigger one to me. Towers scatters the characters we came to know and love in the first film, and that means it lacks some of the cohesion of its predecessor. The main problem stems from my impression that the two pairs of hobbits get too little attention. Merry and Pippin feel almost like afterthoughts, and though Fellowship focused heavily on Frodo, he doesn’t get a ton to do here. His journey doesn’t progress substantially; if anything, that part of the story concentrates more on Gollum than the hobbits. Without question, the elements that involve Aragorn and the others dominate Towers, especially since they include our only significant new characters via King Theoden and his clan. The king provides the best drawn and most effective of the new participants, but all of them seem somewhat thin. We never really get much of a feel for them and they come across mostly like a means to an end. Eowyn especially suffers in that department; the character seems to exist for no reason other than to give Aragorn cause to reconsider his relationship with Arwen. Given my lack of familiarity with what will happen next, I continue to feel that I should reserve my final judgment on Towers until I see King. Many of the perceived problems may evaporate at that time. It almost seems unfair to rate Towers on its own, since it’s really not designed to stand that way. But it’s not like Towers isn’t highly entertaining as it is. For all the nit picking I’ve done so far, the movie remains a terrific spectacle, and it does advance the plot. It clearly sets the stage for the concluding chapter, and it does so in a very solid manner. During Fellowship, Jackson displayed a talent for rich and exciting battle pageantry, and that serves him well in the second film. Towers concentrates more heavily on that side of things; indeed, the final third of the flick comes across as little more than one big fight. The enormity and aggression of those sequences works nicely and makes Towers a satisfying action film. Does The Two Towers live up to the standards set by The Fellowship of the Ring? No, but it does well for itself anyway. Indeed, it improves upon its predecessor in some ways. It lacks the slow and draggy parts of Fellowship, but it also seems less unified and powerful. In any case, these complaints remain minor, as Towers generally seems like a very satisfying flick. 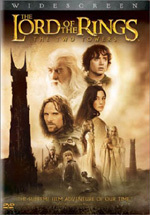 The Lord of the Rings: The Two Towers appears in an aspect ratio of approximately 2.35:1 on this single-sided, dual-layered DVD; the image has been enhanced for 16X9 televisions. New Line know better than to mess up their bread and butter, and the excellent picture of Towers fell in line with those high expectations. I also found much to like about the Dolby Digital EX 5.1 soundtrack of The Two Towers. It featured the same strengths of the audio for Fellowship but lacked that mix’s moderate weakness. Fellowship suffered from rather overcooked bass response. Low-end elements blasted off the charts and became something of a distraction. Happily, that didn’t occur for Towers, which presented very good bass. The low-end remained tight and rich and never presented the boomy quality that marred the prior track. Audio quality equaled the positive nature of the soundfield. Speech was natural and distinctive, and I detected no issues connected to intelligibility or edginess. Music sounded bright and vibrant, as the score presented rich and full tones. Effects came across as accurate and concise. No problems with distortion appeared, and these elements were clean and broad. As already noted, bass response seemed excellent. I found much to like in the terrific soundtrack of The Two Towers. A little less than four months after this initial DVD release of The Two Towers, New Line will produce a super-special edition that packs hours and hours of extras. Because of that, this two-disc set seems destined to become regarded as the “bare bones” version. It’s not without some good extras, though it seems somewhat less packed than the two-DVD edition of Fellowship. We open with On the Set The Lord of the Rings: The Two Towers Starz Encore Special. It runs 14 minutes and offers the typical mix of movie clips, behind the scenes materials, and interviews. We get remarks from director Peter Jackson plus actors Christopher Lee, Elijah Wood, Ian McKellen, Jonathan Rhys-Davies, Billy Boyd, Dominic Monaghan, Sean Astin, Andy Serkis, Viggo Mortensen, Orlando Bloom, Karl Urban, Bernard Hill, Brad Dourif, Miranda Otto, Liv Tyler and Hugo Weaving. We learn a smidgen about some filmmaking issues like bringing Gollum and Treebeard to life, but mostly we just hear a recap of the story. “On the Set” is just your typical promotional featurette and seems totally skippable. A more extensive program comes next. The Return to Middle-earth WB special lasts 42 minutes and 54 seconds and uses a format similar to that of the prior show. We get interview snippets with Jackson, visual effects supervisor Richard Taylor, supervising art directors Dan and Chris Hennah, cinematographer Andrew Lesnie, and actors Wood, Bloom, Otto, Tyler, Astin, Boyd, Monaghan, Mortensen, McKellen, and Serkis. Though longer and richer than “Set”, “Return” remains promotional in nature. Make no mistake – it exists to convince us to go see Towers. Despite that orientation, it seems fairly entertaining. We don’t get a great overall look at the production, but the images from the set offer some good material, and we find a few nice glimpses of how things were done. Short pieces elucidate upon topics like sets and locations, actor training, and various extracurricular activities during the shoot. You’ll find limited amounts of real “making of” information, but it’s a breezy and interesting show overall. Created on the set by actor Sean Astin, a short film called The Long and Short of It pops up next. It begins with a 73-second intro from Astin; the flick itself fills five minutes, 51 seconds on its own. Created with Rings stand-ins and crew – including a quick cameo from Peter Jackson - the dialogue-free movie tells the tale of a short woman and a tall man who help an average-sized dude hang a wall advertisement. It’s cute but not really very entertaining. If you enjoyed the prior offering, check out The Making of The Long and Short of It. This eight-minute and seven-second shows us what cast and crewmembers did what jobs on Short. We also learn about the project’s genesis and see the antics on the set. It’s a somewhat tongue-in-cheek and fairly entertaining little piece. 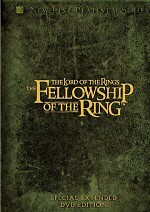 In the section called Lordoftherings.net Featurettes, we get eight of these pieces. They run between two minutes, 49 seconds and four minutes, 41 seconds for a total of 33 minutes, 39 seconds of material. I liked the Lordoftherings.net featurettes on the old Fellowship DVD, but these seemed a bit less compelling. They focused on the flick’s villains, the creation of its audio, theRohan capital Edoras, various creatures of Middle-earth, Gandalf the White, arms and armor, the Battle of Helm’s Deep, and Gollum. In addition to movie clips and material from the set, we hear comments from Jackson, actors Wood, Astin, McKellen, Brad Dourif, Lee, Hill, Urban, Mortensen, Rhys-Davies, Otto, Monaghan, Boyd, Serkis, visual effects supervisor Richard Taylor, supervising sound editor/co-sound designer Ethan Van Der Ryn, producer Barrie Osborne, supervising art director Hennah, conceptual artists Alan Lee and John Howe, digital model supervisor Matt Aitken, director of animation Randy Cook, visual effects supervisor Joe Letteri, creature supervisor Eric Saindon, executive producer Mark Ordesky, stuntman Sala Baker, creature facial lead animator Bay Raitt, and co-producer Rick Porras. A few of the featurettes seem pretty good. The one about the Middle-earth creatures offers some nice design information, and the Gollum piece elaborates on that topic well. I especially like the latter’s depiction of “before and after” shots with actor Serkis. Unfortunately, many of the featurettes come across as little more than promotional items. They tell us only a little about the making of the movie and they include too many movie snippets. The Gandalf segment was the weakest in that regard. Some good material does appear here, but overall the featurettes seem somewhat lackluster. Remaining in the promotional vein, we get both the film’s teaser and its theatrical trailer. We also locate a whopping 16 TV Spots plus a music video for Emiliana Torrini’s “Gollum’s Song”. The latter mixes the tune with a montage of clips from the movie and some shots of the singer as she records her vocal – yawn! Towers fans may hate the Special Extended DVD Edition Preview, since it may make their wait for that package seem even longer. Actually, I doubt the five-minute and 14-second piece will frustrate too many. Like its predecessor on the two-disc Fellowship DVD, it quickly discusses the additions to the film and the package’s supplements, so it’s a nice appetizer but nothing terribly compelling. Even more enticing for fans is the Behind the Scenes Preview of The Lord of the Rings: The Return of the King. Scheduled to come out in mid-December 2003, this 12-minute and 33-second program mixes snippets from that film with some interviews and a few behind the scenes images. We get notes from director Jackson, producer Osborne, writer Boyens, executive producer Mark Ordesky, conceptual designer/set decorator Alan Lee, previsualization supervisor Christian Rivers, actors Mortensen, Boyd, Monaghan, Astin, Wood, Urban and Hill. It focuses on the new movie’s general thrust and some of the work done to make it. The program sets the stage acceptably well, though it mostly concentrates on filmmaking issues. Yet another promotional preview touts the Return of the King Video Game. In this 181-second clip, we see some images from the product and learn a little about its making. Don’t expect much more than an attempt to sell it to you, though. Lastly, Towers features some DVD-ROM materials. We find two different weblinks. One goes to the official movie website at Lordoftherings.net, while the other provides “exclusive online content”. As I checked this out five days before Towers hits the street, the link didn’t work. One very nice element of the DVD’s extras: most of them include English and Spanish subtitles. Only a couple of studios consistently add text to the supplements, so it’s good to see this here. I think subtitles for extras should be the rule, not the exception. 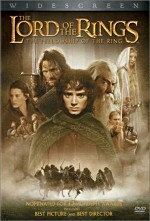 While not quite as terrific as its predecessor, The Lord of the Rings: The Two Towers provides a solid flick on its own. It seems likely to gain in stature when the trilogy ends, but it still works quite nicely in the meantime. The DVD offers excellent picture and audio and includes in a fairly superficial but moderately useful roster of extras. I definitely recommend The Two Towers, though I do so with the caveat that you really need to see The Fellowship of the Ring first. Note: as I mentioned earlier, New Line will produce a much more elaborate DVD package of Towers about three months after the release of this two-disc set. That version will include a substantially longer cut of the film as well as tons of extras not found here. Based on my experiences with the four-disc Fellowship, none of this package’s supplements will also appear on the “deluxe” set. 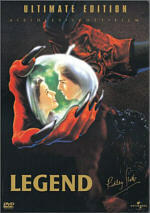 This two-DVD release will remain the only way to see the original theatrical version of the film.